Does your child have a passion and a love for dogs or cats? HHS is now offering birthday parties held at our brand new BISSELL Community and Training Center. Guaranteed fun for your party animal and stress-free party planning for you! 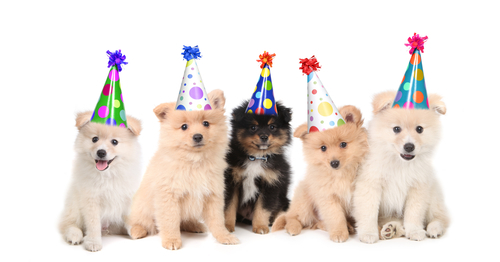 HHS will coordinate activities, animal visits, and lots of fun into every “party animal’s” birthday. And of course, lots of FUN! And of course, a PAWSOME time for your child and his or her friends! HHS is not responsible for set up or tear down of the party room. There will be a HHS staff member to assist. Tables and chairs will be provided. Food, drink, and decorations are welcomed and encouraged (fridge available for use). * Base prices are for up to 10 children, including the birthday child. There is a $10 fee per additional child up to 14 maximum per party. Five adult chaperones may attend at no additional charge. A $100 non-refundable deposit is required at the time of registration and applied to your balance.